And, with that, Long John Chapter 2, “Bird’s Eye,” returns after over a year away. 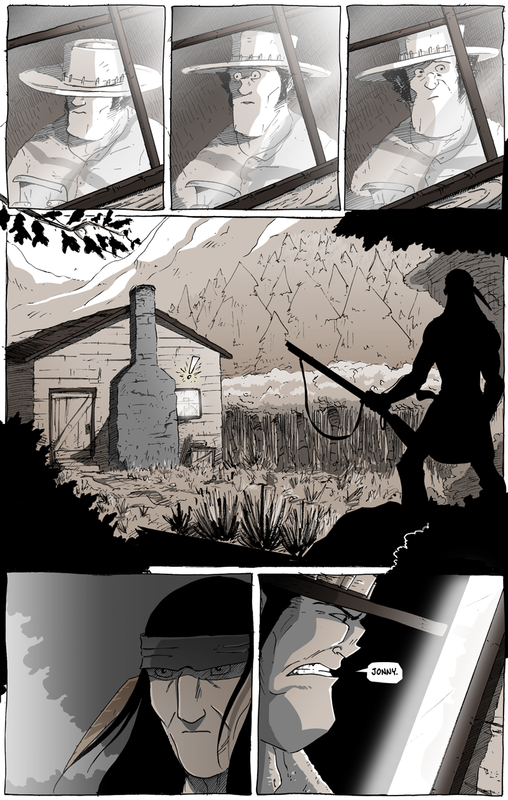 With hope, this first page provides a little bit of solace as we come back from the hiatus as we get to meet Jonny Mono, one of the infamous (by this point) “Johns” that Long John travelled with before page 1 of the comic. With that in mind, time is a fascinating tool to use in comics. Albeit bolstered by the fact that there was an extended break and the relatively slow release of pages on a webcomic schedule, it’s funny to think that––in the context of the narrative––only one night has passed since the comic started. I hope it reads naturally and not as an abuse of the natural passage of time (something that happens quite a bit in movies, usually bad movies, re: 2007’s Transformers). On a micro level, time is an incredibly important tool for comicking, as I tried to use to full effect here (and also on the next page). Perhaps it’s a fun way to intentionally manipulate the reader, perhaps it’s because of the strange connection it has to my limited animation background, but I enjoy showing subtle change from basically the same angle like I do in those first three panels. It’s a technique meant to slow the reader down and is a technique I’ve enjoyed using since my last comic while, at the same time, giving a feel that the scene is more “animated” than usual since we are seeing a variety of poses from the same angle. The technique is an idea similar to those “search for the differences” game where a reader is presented two pictures with slight differences between them and asked to spot where the similarities diverge. The reader has to focus on the art, looking from corner to corner and take it all in. When presented with multiple panels that basically look the same, the reader naturally tries harder, bringing in the focus, wanting to find the differences and, in the case of a comic, pieces together the subtlety. In a sense, it’s a chance to show off the “acting”; my goal is to actually have the readers “see” Long John turn to look at the window in their minds rather than just show him looking up in one panel and then an outside shot in the next. He’s moving from one important moment (the advertisement) to another (seeing Jonny Mono outside), and I really wanted that small linking movement to stand out. A reader’s natural response when reading anything is to continually ask “why.” Luckily, while making fiction, creators have this on their side; I figure it’s the writer’s goal to try and get them to ask that question in as many different ways as possible (except for “why are you making this?”). 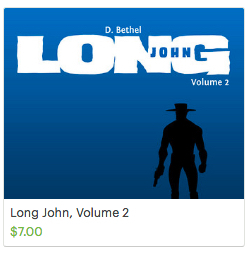 Also, if a twice-a-week update schedule is too slow for you, Long John, Volume 2 is already available for purchase in the store. Like Volume 1, it’s $7.00 plus $3.00 for shipping (within the continental US). If you buy it online, I’ll draw a custom Long John sketch and include a bookmark for free. Check it out, it would really help out a completely independent comicker trying his best to do his best. But if you’d like to wait, no harm, no foul; we’ll have two new pages a week for the next few months until Chapter 2 is done.